On the south side of the Georges River is the quiet, leafy suburb of Como. And it’s here that you’ll find one of the most aesthetically pleasing pubs in Sydney. 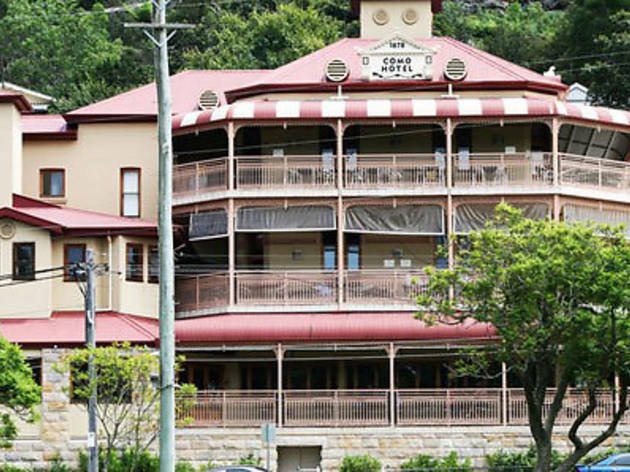 The Historic Como Hotel had a run-in with some open flames in 1996 (the results of which are displayed in framed photos around the pub) and it would be five long years before the old girl was restored to her former glory. But now she stands proudly with an Australian flag flying from the turret and enough white iron lace work to please every elderly aunt in Sydney. Three tiers of balconies look out over well-kempt football fields that lead down to the riverbank. The topmost one is reserved for functions, the middle is hard-fought-over ground for the bistro and outside the public bar the balcony is packed with people watching the rugby being played over the road. Downstairs, all eyes are on sport of some description and all hands nurse schooners of Kent Old Brown, Carlton Mid, Reschs, VB, Carlton Black and Guinness. Upstairs is where you’ll find everyone who’s not watching the title fight. On weekends the dining room is full to bursting with extended family groups celebrating birthdays and older couples frequenting their local. There’s a little bar up here and you’ll pay $8.40 for an Asahi, but a Carlton schooner is a far more wallet-friendly $5.60 – best ordered through the window while keeping a sharp eye on the little ones in the fenced off cubbyhouse. The bistro isn’t cheap, but it’s generous. The fish of the day is a whole baby snapper with salsa verde, chips and salad and at $26 it’s only two bucks more than the standard fish and chips. Or save your dollars for the $15 Thursday night rib special. 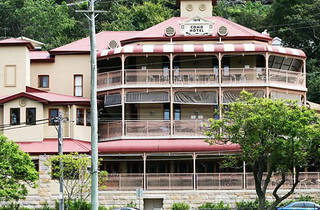 The Como Hotel is beautiful, friendly and generously proportioned and well worth a look in.